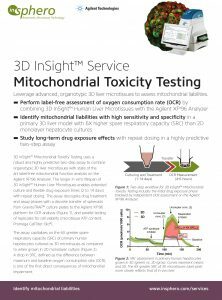 3D InSight™ Mitochondrial Toxicity Testing uses a robust and highly predictive two-step assay to combine organotypic 3D liver microtissues with state of the art label-free mitochondrial function analysis on the Seahorse XFe96 Analyzer (Agilent Technologies). The longer in vitro lifespan of 3D InSight™ Human Liver Microtissues enables extended culture and flexible drug exposure times with repeat dosing. 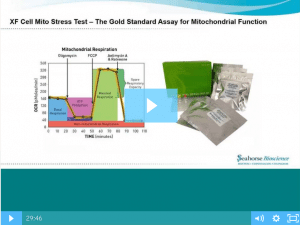 Enable high-sensitivity mitochondrial liability assessment with a two-step workflow that includes the initial drug exposure phase followed by independent OCR assessment on the Seahorse XFe96 Analyzer using the specialized Seahorse spheroid microplate. Assess SRC in 3D primary human hepatocytes (green) displaying a 4X greater SRC (red-shaded area) than 2D PHH (gray), more closely reflects that of in vivo liver. (Curves represent means and standard deviations normalized to 1000 cells). Enable mitotoxicity testing in a standardized, metabolically robust 3D model with 4x greater SRC, thus ensuring experimental reproducibility for longitudinal and multi-site studies. 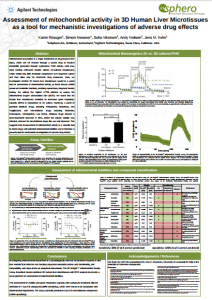 (Bioenergetics profile of 6 independent runs of OCR in untreated human liver microtissues: green line indicates mean across replicates; shaded area depicts standard deviations).